Neil Bartlett’s had a hell of a career. Before seeing The Plague last night (adapted and directed by N.B. – from Camus, as if you needed telling) I happened to be at the Live Art Development Agency doing a day looking at the magazine Performance (1979 – 1992), which has now been put online. This was accompanied by a short film, in which one of the interviewees talking about the magazine’s importance to the Queer performance art scene in the eighties was Bartlett. Some time after that (1994 – 2004) he ran the Lyric Hammersmith, with the sort of programming that makes me green with envy that I wasn’t in London then. Somehow, I think this might be the first thing made by Neil Bartlett that I’ve ever seen (which, given that he’s been working my entire life, and I’ve been going to theatre for half of that, seems utterly ridiculous). Anyway. I really liked The Plague. It’s a fascinating production. I mean, my default description would be claiming – based on not-very-much-evidence/memory – that the production itself “feels a bit nineties”. The lighting states of white and red against the black back wall of the theatre feel more stark and sur-le-nez than we tend to get now. The five-strong cast do low-key-but-ostentatious use-the-whole-(small, mostly bare)-stage movement. But – and here’s the thing – it’s *really* good. And it’s *not* “nineties”, it’s right there in front of you, made live every night, in 2017. Neil Bartlett (unsurprisingly) really knows what he’s doing. If you want a further confession of my inadequacy, I struggled a bit with Camus’s allegory. The piece tells the story of a modern town that becomes infested with a plague. Apparently the book was written in the aftermath of WWII, and is about Nazi occupation. I can’t be the first person to think that “an infestation of rats” is an infelicitous choice of metaphor, given Adolf Hitler’s enthusiasm for the same analogy to justify his murderous impulses. No, but really, isn’t a plague is a *terrible* allegory for the spread of fascism? Plagues kill the person who gets it, and then the person needs to be burned. Fascism doesn’t kill the host, you need partisans for that. And the solution to the plague isn’t to murder everyone who’s been infected. That doesn’t solve risk to everyone else. Although, I guess if Camus is dealing with the aftermath of the Vichy regime, he is writing about just how horrible resistance can actually be as well. This is perhaps the unexpected and sobering take-home here. That this is a piece that ultimately says, the only way you can cure Nazism is to burn it out. It’s not pleasant, and you’ll all have to do things you don’t want to do, but there it is. And, even when you’ve done that, the bacteria will still be there, somewhere. So, it can’t be cured. And when it turns up again, you’ll have to do the same thing again. As many people will have to die as need to for it to be cured. What’s brilliant about the analogy is that it isn’t a celebration of heroism. It recognises that fighting fascism makes monsters, not heroes, and yet it still needs to be done. As a matter of basic human survival. 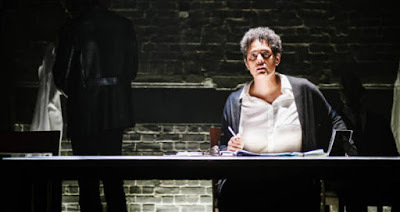 As such, this is about as trenchant, mordant and timely a piece of theatre as you’re likely to see this year. It’s bracingly cheerless. But more true than any number of pieces about “understanding the other person’s point of view”.